Plextor has officially announced its optical media eraser known as Plexeraser PX-OE100E. 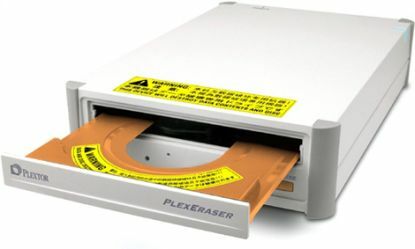 Plexeraser supports following optical media: CD-R/CD-RW /DVD-R/DVD+R /DVD-RW/DVD+RW/ DVD-R DL/DVD+R DL. The time taken to erase these disks is approximately 3 minutes. As of now Plextor has not revealed the pricing of this product. Plextor had developed its own new technology that destroys the data-logging part on the CD/DVD disc by a laser beam. This directly destroys the data recording layer in the disc, which means the data is unreadable and unrecoverable. After the data is destroyed, the drive automatically marks the disc to show which ones have been destroyed and which have not. The robust, professional drive is designed to be used continuously if necessary. The PlexEraser destroys eight types of formats: CD-R/CD-RW/DVD-R/DVD+R/DVD-RW/DVD+RW/DVD-R DL/DVD+R DL. It also destroys both 12cm and 8cm sizes. It takes, on average, 3 minutes to destroy CD-R/RW, DVD+R/RW, DVD-R/RW and 6 minutes for dual layer (DVD+R DL, DVD-R DL). To prevent accidentally destroying your data, the PlexEraser is the only drive with a bright orange tray. It has an easy operation – simply insert the disc that you want to throw away and it starts automatically. When it finishes, the disc is automatically ejected. In addition it has low power consumption and very low operating noise, just 35 decibels – barely noticeable even in a quiet office.